Licence of the BRITISH QUEEN and that of the GARIBALDI transferred to this new house 21.08.1890. 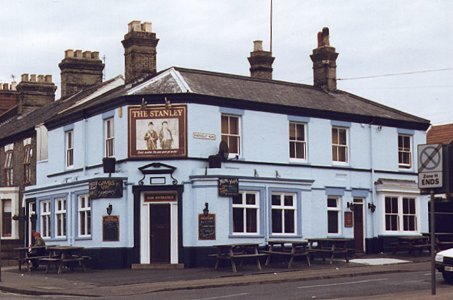 At that time the house was to be called the DUKES HEAD, however on 23.09.1890 the name was changed to the STANLEY ARMS. Arthur Towlson made an application, on Monday 24th August 1891, for a music and singing licence. He desired the licence for the convenience of his customers who were desirable of forming a musical union. The event would be held in the bar-parlour which had a separate entrance to the street. The magistrates refused the application. Known in the late 1900's as the STANLEY, with a Laurel & Hardy theme. Etched glass to windows saying `Bar', `Retail' and `S&P'. Separate public bar, snug, lounge and club room. Original bar fittings in dark wood. When owned by Steward & Patteson it had a beautifully painted sign showing Stanley greeting Dr. Livingstone in the jungle. This was replaced (in typical fashion) by Watneys when they took over in the 1960's.